During the summer I rarely eat pasta as I prefer lighter and cooler meals in the hot weather. 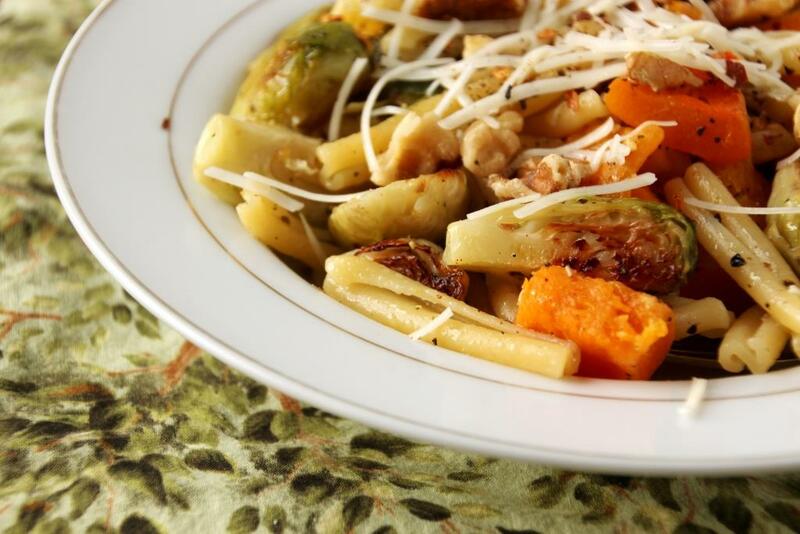 As the temperature drops and the leaves change, I reintroduce pastas and soups into my regular rotation. However, with Montana’s bipolar weather patterns, fall typically holds as many days in the 70s as it does in the 40s, which makes my usual bulk preparation a bit more challenging. Quinoa salads are great for this, because they are excellent both warm and cold, making it easy to match the weather and my mood for the day, but I don’t want to eat one every week. 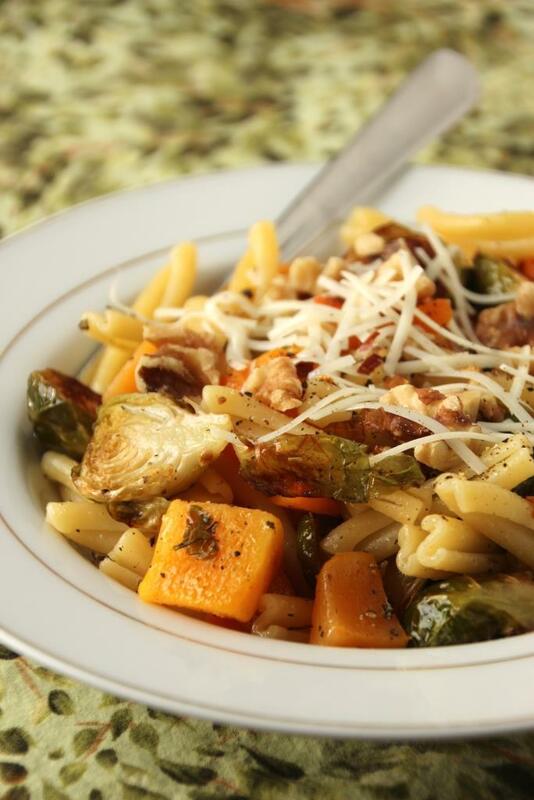 Another option are vegetable-heavy pasta meals that don’t involve a heavy sauce. 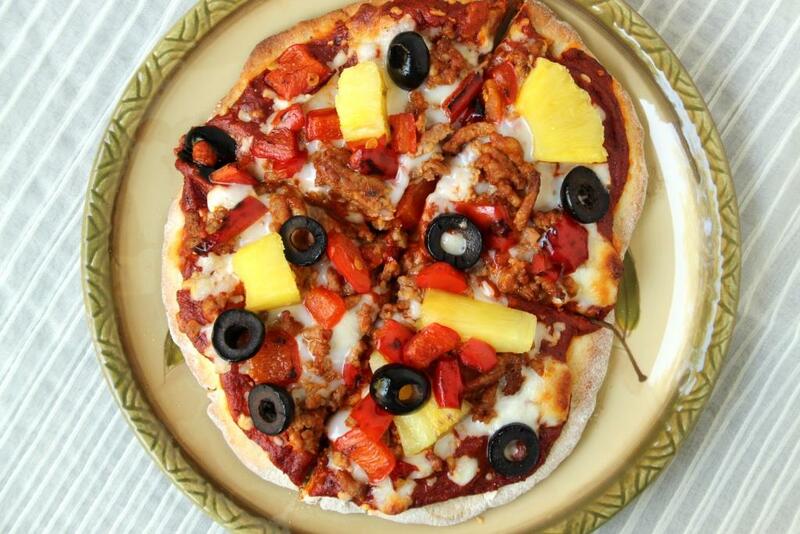 This recipe is partly inspired by my favorite cookbook, written by an elite distance runner. 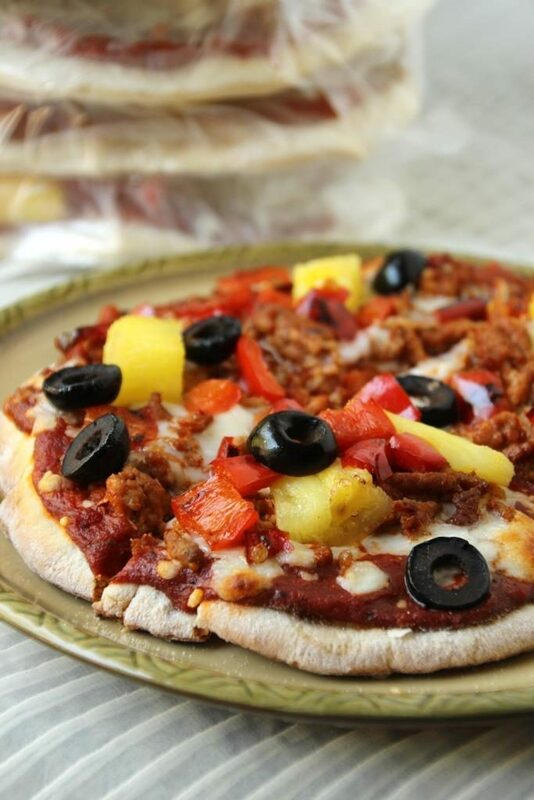 It’s full of hearty and delicious meals that aren’t “skinny” but still full of veggies and healthy fats. I modified my version slightly, adding Brussels sprouts and changing the spices a little, based off a similar recipe online. 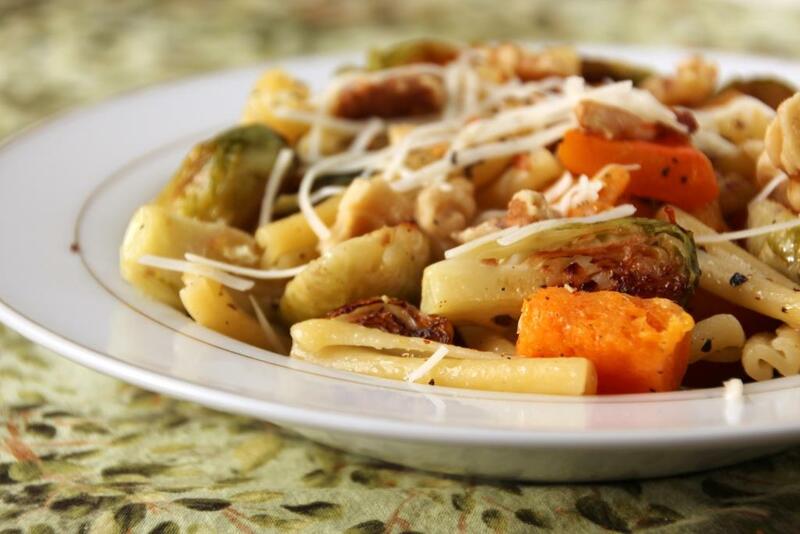 The result is a colorful mix of veggies and pasta, falling somewhere between a light summer entree and a cozy fall one. Brussels sprouts are a winter staple for me, as they keep well in the fridge and roasting them is simple and always delicious. (They are also sold at Costco, which admittedly factors heavily into my produce selections.) The butternut squash takes a bit more effort to prepare, but you can really streamline the process by buying the pre-diced version. This does feel slightly ridiculous, but it saves a huge amount of time and effort so personally I think it’s worth the extra couple dollars. Browned butter adds a nice caramel flavor, complimented by herbs and a few red pepper flakes. I kept my sauce on the light side as I wanted the veggies to shine, but absolutely double the sauce recipe if you want a more decadent experience. I opted to add toasted walnuts for some crunch, and parmesan (because you can’t go wrong with cheese) for a delicious protein boost. I personally loved this recipe in its original vegetarian state, but some crumbled bacon or prosciutto would be a nice addition as well. It reheats nicely for leftovers, and is also pretty good cold if you didn’t add too much extra sauce. Welcoming in the fall vegetables without the heat or heaviness of a chili, it bridges the divide from summer to winter with a more gradual shift. 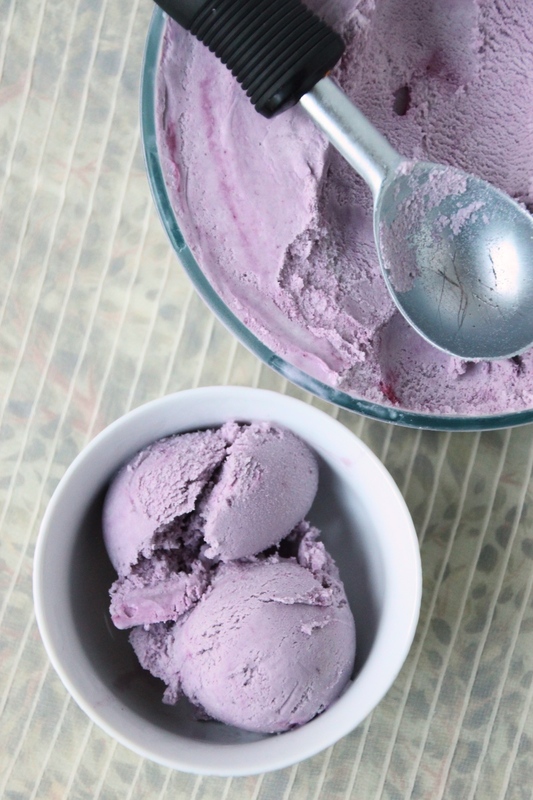 If, like me, you’re in a place that can’t quite make up it’s mind about the weather, a batch of this will be that perfect mix of cozy and cool. Preheat oven to 400 degrees Fahrenheit and line two baking sheets with aluminum foil. In a large bowl, mix together butternut squash and 1 tablespoon of olive oil until squash is well coated. Spread in an even layer on one baking sheet. In the same bowl, mix together Brussels sprouts and remaining 1 tablespoon of oil, mixing until well coated. Spread in an even layer on the other baking sheets. Sprinkle both sheets with salt and pepper, to taste. Roast for 30 minutes (squash on top), stirring halfway through, until squash is tender. Remove squash from oven and move sprouts to the upper rack, roasting another 5-10 minutes until browned and crispy. Meanwhile, cook pasta al dente, according to package directions. Drain and set aside. When the veggies have about 10 minutes remaining, make the sauce: melt butter in a large pot (I used a wok) over medium heat. Simmer until it begins to darken and contains brown flecks, stirring occasionally. Turn off the heat and stir in garlic and spices. When the veggies and pasta are done, stir gently into the sauce until completely combined and evenly coated. 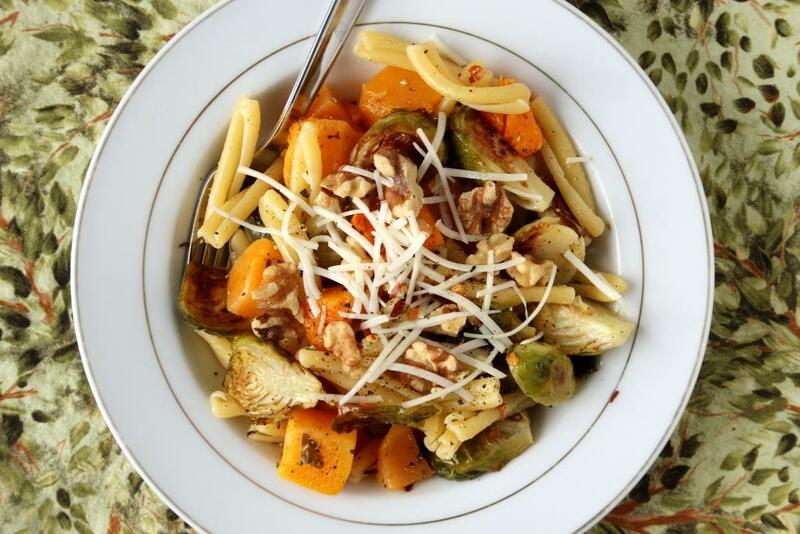 Serve hot with extra grated pepper, optionally topped with one tablespoon each of Parmesan and toasted walnuts. 1 I kept the sauce fairly light as I wanted the veggies to shine through. If you’re looking for a rich, buttery experience, feel free to double the sauce recipe. 2 To toast walnuts, spread on a baking sheet and bake at 400 degrees until warmed, lightly golden, and a little crunchier (about 5 minutes). Despite what looks like an excessive ice cream intake, during hot weather I also eat a lot of chilled salads and smoothies as a healthy way to keep cooler. With no stove or oven required, it doesn’t add heat to either me or the house, and they are quick to throw together. My fridge is always filled with an array of fresh produce, but during the summertime I make extra sure to have plenty of salad ingredients on hand. Spinach is my go to base since I use it in everything from soups to scrambled eggs to smoothies, and there’s always a hefty bag of it from Costco. 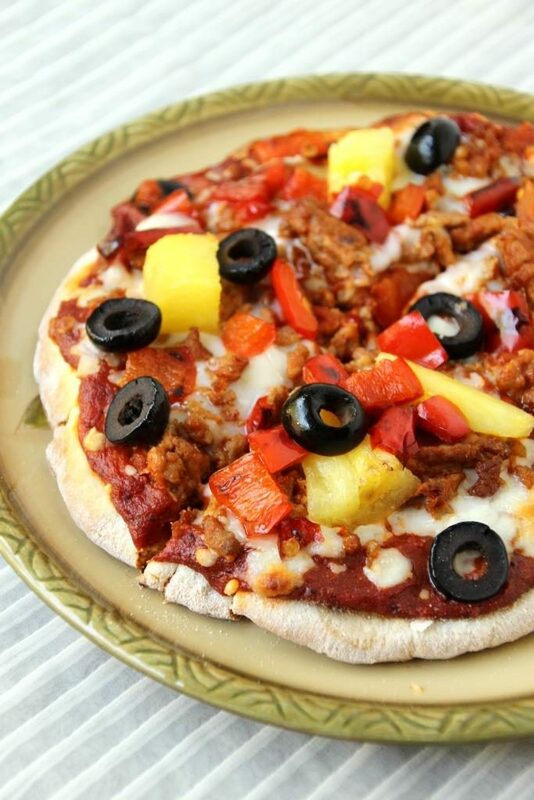 I don’t usually have a specific flavor palate in mind, but throw on whichever veggies or fruits I have lying around. I often add some raw nuts, cooked quinoa, or canned beans for extra calories and a protein boost. Tossed with a flavored vinegar or a simple dressing, it’s a delicious and filling meal and easy to throw together for a quick lunch or dinner. 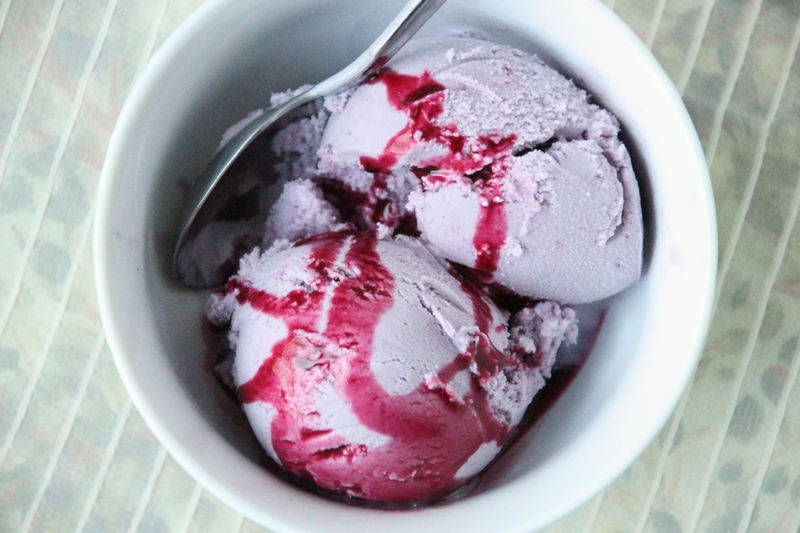 Last year I concocted a lemon and berry combination that is still one of my favorites, especially with raspberries fresh from the garden. In these months before the berries have ripened, I sometimes splurge on a tray of blackberries from Costco to eat throughout the week. Delicious on yogurt or ice cream, in a smoothie, or just by the handful, it’s never a challenge to get through them on my own. 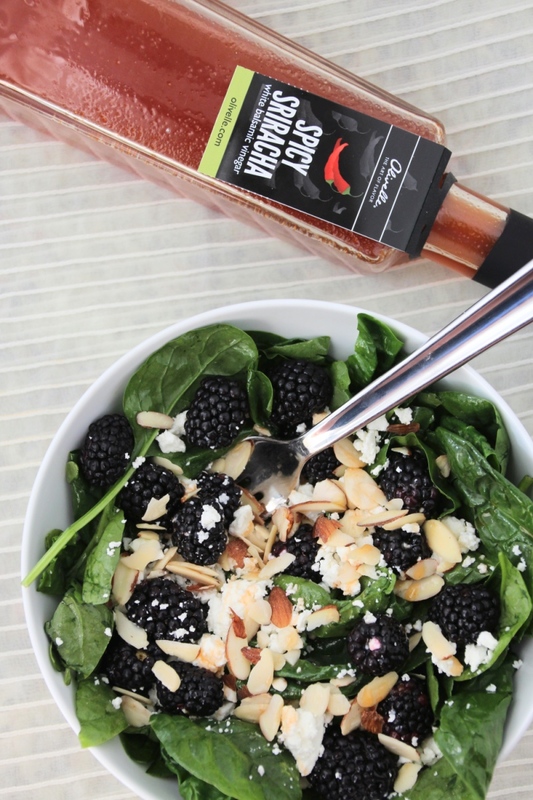 Since I love the berry and spinach combination, I decided to combine some blackberries with my newest favorite Olivelle discovery: Sriracha White Balsamic Vinegar. Still fairly sweet but with the slight kick of Sriracha flavoring, this is a more savory experience. It’s superb as a dressing all on its own, excellent as a condiment for wraps, and delightful mixed in with scrambled eggs. I’m already halfway through my rather hefty bottle, and I know I’ll be back promptly when I need a refill. 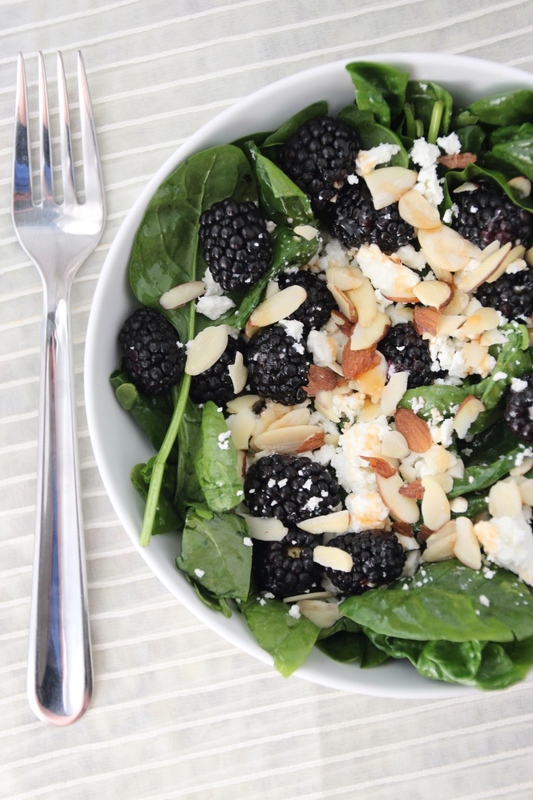 I started with my standard spinach based, and topped with fresh blackberries and sliced almonds. As I usually have goat cheese in the fridge as well (how do people live without Costco? 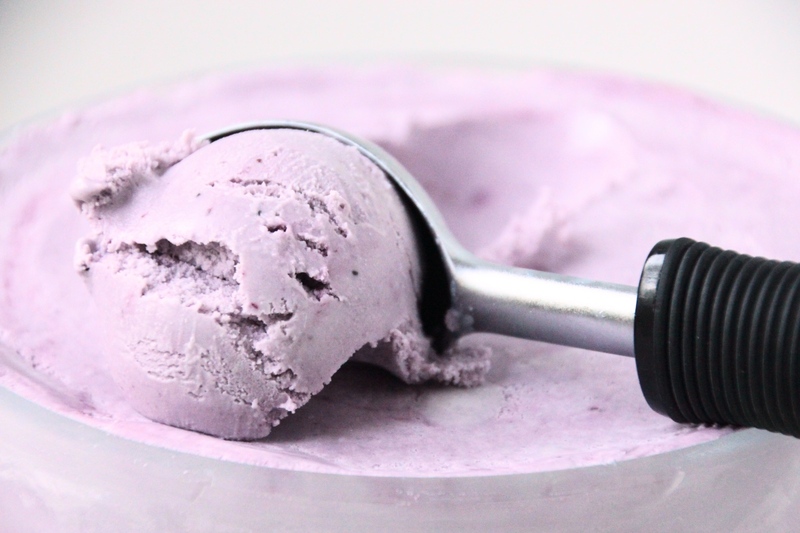 ), I added that for some creaminess and a little tang. The sweet and spicy Sriracha vinegar pulls everything together with a little kick, but not so much that it overwhelms all the other delicious flavors. 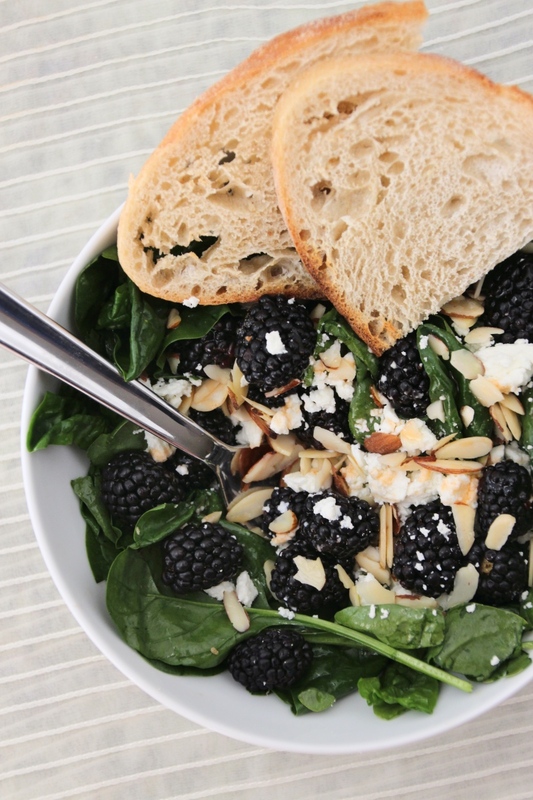 This salad is great as a light meal with a side of tasty sourdough bread, but works just as well alongside a chicken or fish entrée. For those of you that are perhaps not keen on buying specialty vinegar, I’ve included a recipe for a copycat version. It’s not a perfect match but it’s still delicious, and a bit more accessible than mail-order vinegar. 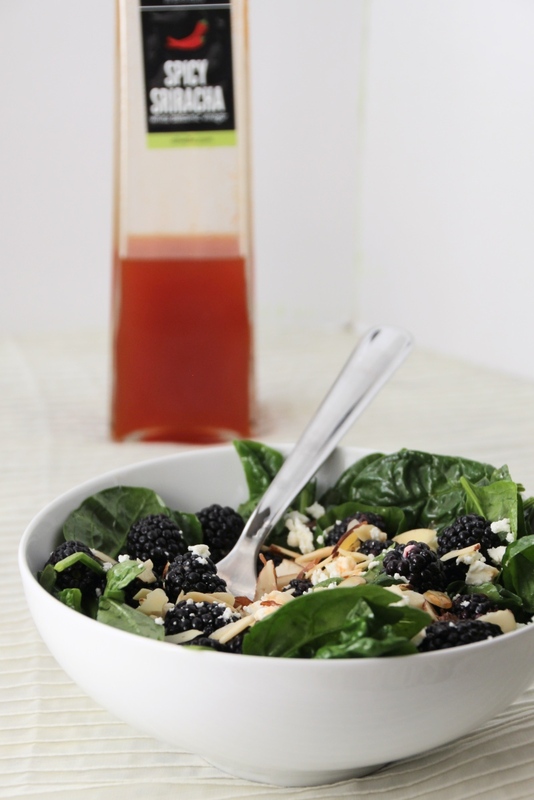 In a medium bowl, gently stir together spinach and Sriracha vinegar until well coated. Transfer spinach to serving dish(es). 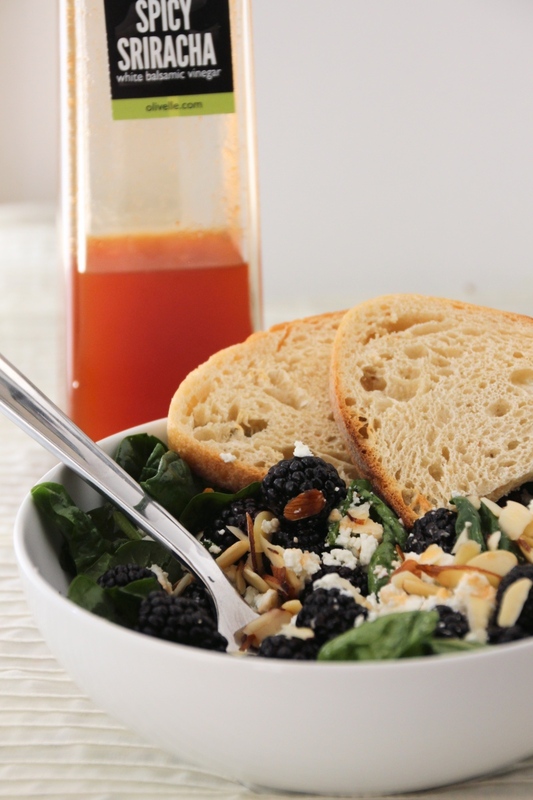 Arrange berries, goat cheese, and almonds on top, optionally drizzling with extra vinegar. Enjoy immediately as a spicy-sweet entrée for one, or as side dishes for two. In a small saucepan, gently heat vinegar and Sriracha to a simmer, and let simmer until liquid is reduced to about 1/3 cup. Whisk vigorously to mix in Sriracha (there may still be speckles.) Add more Sriracha to taste, if desired. Store in a sealed container in the refrigerator, shaking or whisking before each use if spices have settled. Like many teenagers, I rarely packed a lunch for school. Possibly unlike many teenagers, this was mostly because my objectively large lunch group was typically so annoyed at my exceedingly slight build they would just hand me food to eat. Albeit a little annoying in its intent, my laziness won out over my dignity and I happily accepted nearly anything people were willing to share. At some point during my high school career, a place next door started a lunch business serving bowls of Asian-inspired cuisine, like General Tso’s chicken and sweet & sour pork. They were all $5 per bowl and came with white rice, so my favorite teriyaki chicken bowl became somewhat of a staple food in my life. I was much too cheap to fork over my own money very often, but would delightedly finish off other’s leftovers or graciously accept a gift if one of my extremely generous friends felt so inclined. These days I nearly always pack my own lunch and try to aim for healthier options, but my love of teriyaki has not waned. I rarely eat it, for reasons unknown, but when I saw these teriyaki meatballs on Damn Delicious I knew I had to give them a try. With a freezer full of venison, antelope, and elk, I did not opt to buy the ground pork advised in her original, but I thought my all venison version was exceptional. With this in mind I believe nearly any species of ground meat would suffice, but if you prefer the mixed meat combinations then by all means please do so. 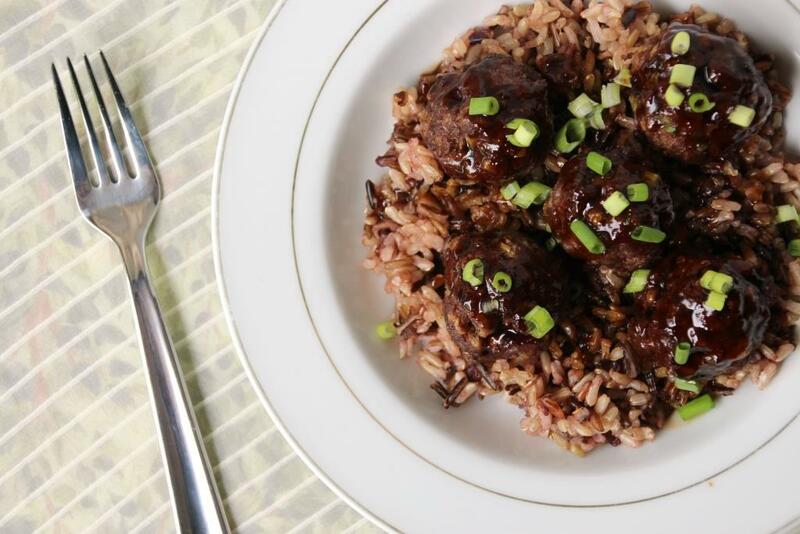 Moist and flavorful, the meatballs are pretty excellent all on their own but also obviously improved by a delicious teriyaki sauce. I made the original version as directed the first time, but found it far too sweet for my personal taste. Although it was delicious, it was more along the lines of a sweet & sour profile than a savory and tangy teriyaki. As such, I’ve made some alterations, mostly cutting the sugar in half, which resulted in just the right amount of sweetness for me. 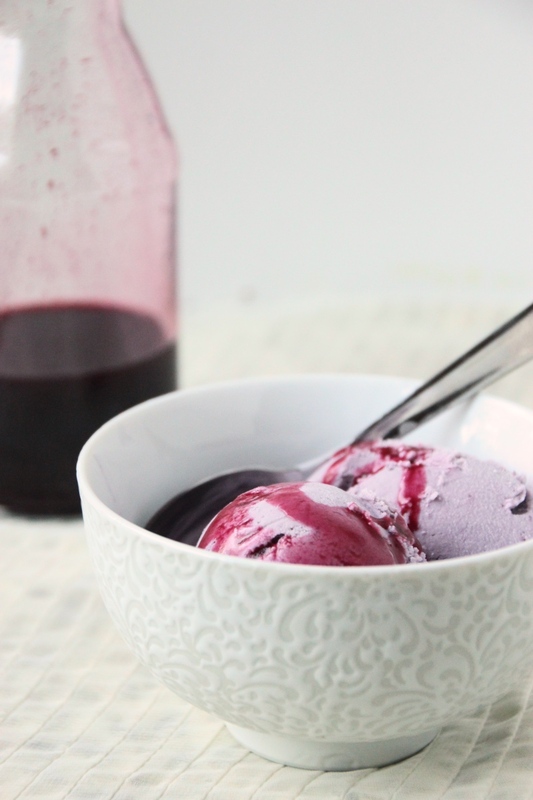 If you like a sweet teriyaki sauce, you can certainly increase the sugar along the way. I paired mine with my favorite wild rice mix and a side of roasted broccoli, which rounded out into a lovely dinner. The meatballs and sauce would also be excellent as an appetizer (don’t forget the toothpicks!) or as a fun twist on a meatball sandwich or wrap (I’d garnish mine with sprouts.) I like lots of sauce so I made a large batch; if you have leftovers, it’ll be great drizzle over veggies or salad, mixed with scrambled eggs, or paired with grilled chicken or salmon. I never worry about extra sauce, but if you’re not a big sauce person or are serving these as an appetizer, you could likely cut the recipe in half. This is a great summertime meal, and to cut down on prep time just roll the meatballs ahead of time and store in the fridge till you’re ready to bake. If you have a second baking sheet you can roast your veggies at the same time while you make your sauce and cook the rice, and within 30 minutes dinner will be ready. The whole shebang also reheats great so look forward to those leftovers tomorrow. Preheat oven to 400 degrees Fahrenheit. Line a baking sheet with aluminum foil and coat lightly with olive oil or cooking spray. Set aside. In a large bowl, add all meatball ingredients. Use your hands (yes it’s messy) to mix together until completely combined. Roll 2 Tbsp into a ball and set on prepared baking sheet; repeat with remaining meat mixture, leaving at least 1″ between meatballs. Bake for 20-25 minutes, or until nicely browned and cooked through (165*F on an instant-read thermometer). 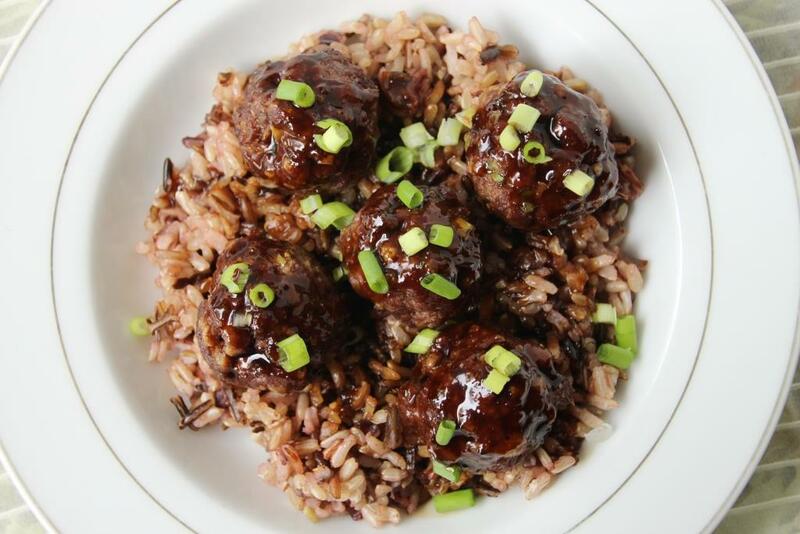 While the meatballs are baking, add soy sauce, brown sugar, honey, ginger, and garlic powder to a small saucepan. Heat over medium until sauce reaches a simmer, then taste carefully (don’t burn your tongue!). For a sweeter sauce, add additional brown sugar and return to simmer. Whisk together cornstarch and water and slowly stream into the pan, whisking constantly. Continue to heat over medium, whisking often, until mixture thickens to desired consistency (for me this was 5-10 minutes, I like it thick). 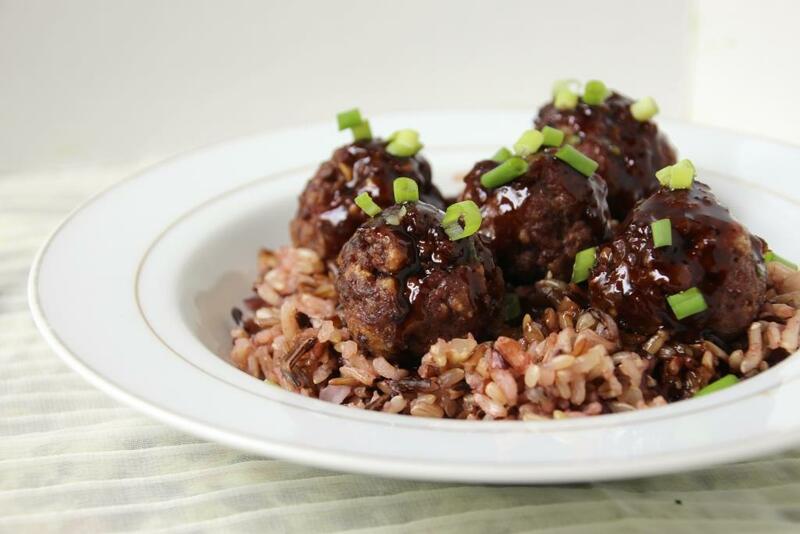 For an appetizer: pour some sauce into a shallow bowl or serving dish and arrange meatballs inside. 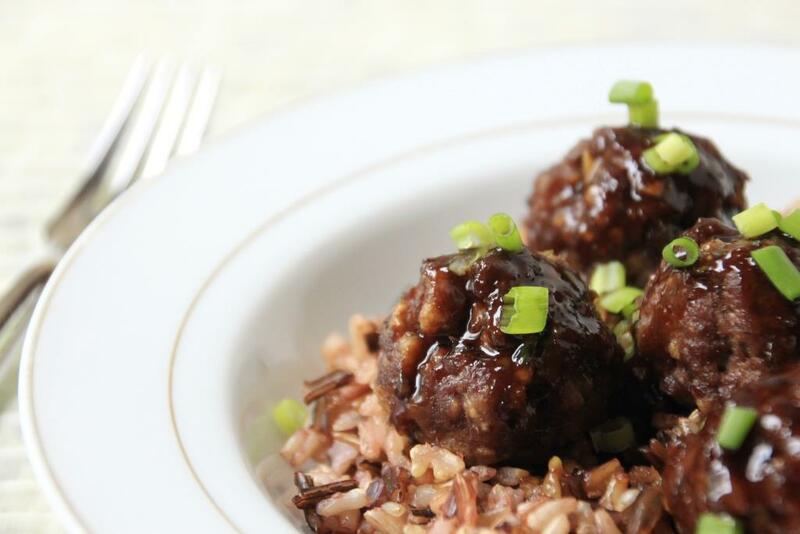 Drizzle additional sauce over the meatballs and sprinkle with sesame seeds or other garnish. For an entrée: serve atop your favorite rice or grain; roasted broccoli or Brussels sprouts make an excellent side. 1 If you’re serving these as an appetizer, you can probably make half the amount of sauce, but I don’t consider extra teriyaki sauce to be a burden so really it’s up to you.